New York Giants owner John Mara is planning talks with star wide receiver Odell Beckham Jr following his critical comments. 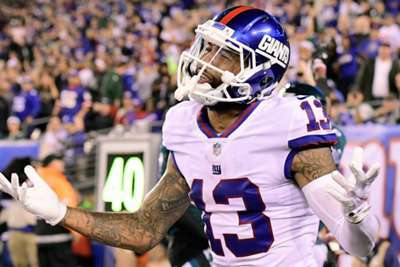 Beckham – who signed a five-year contract extension in August – has been candid about the Giants' struggles this NFL season in the wake of their 1-5 start. The three-time Pro Bowler came under fire last week after an ESPN interview in which he questioned quarterback Eli Manning and head coach Pat Shurmur, among other things. Although Beckham apologised for his comments, they earned him a fine from the Giants, while president and chief executive Mara said the 25-year-olds "needs to a little more playing and a little less talking". On Wednesday, Mara said he intends to sit down with Beckham and talk. "I will [talk to Beckham] at some point," Mara said. "I've had a number of those conversations with him in the past, but at some point, I'll probably sit down with him." Mara still has confidence in Beckham, adding: "Listen, I think he wants to win. He wants the same things that we want. He's a work in progress, but I still believe in him."